Stampin' Up ideas and supplies from Vicky at Crafting Clare's Paper Moments: Free Cottage Wall designer paper! Free Cottage Wall designer paper! My Buckingham card classes have been running for a few weeks now and it's lovely to see people enjoying crafting together and making some great projects. This Friday, 14th May, there'll be an added bonus for those coming to the class - I'll be entering everyone into a prize draw for the chance to win this pack of 12 double sided sheets of 6"x6" Cottage Wall designer paper. 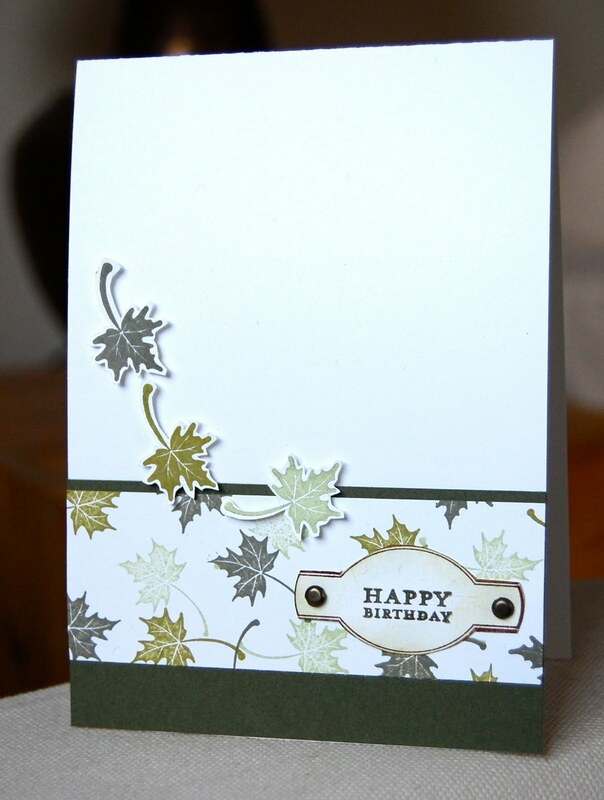 Here's one of the cards we made at last week's class. In contrast to the very feminine number we also made (see yesterday's post), this is a masculine card that follows the design rule that what is NOT on the page is just as important as what IS there. The leaf image is from the Autumn Days set - which should definitely not be kept in storage until Autumn! I've used one of the tags from the hostess set Punches Three - it's easy to change the sentiments on them if you use a marker and a stamp-a-majig. The tag is attached to the card with these vintage brads which I find invaluable for masculine cards. Thank you for dropping in to see my work today. Do leave a comment or ask questions if you'd like to. I enjoy reading all of your comments and appreciate you taking the time make them. Oh! Vicky I`d love to come to one of your classes but it`s rather a long way from Hull (sigh). Last weeks card is stunning. Love this card even more than yesterday's. I wasn't going to get this stamp set.... but.... now I really need it! Your classes sound so fun, Vicky! What a great card. I agree about the Vintage Brads -- they seem to make their way onto the vast majority of my masculine cards.